Behemoth is definitely all about melee, but more importantly, melee from reserves. 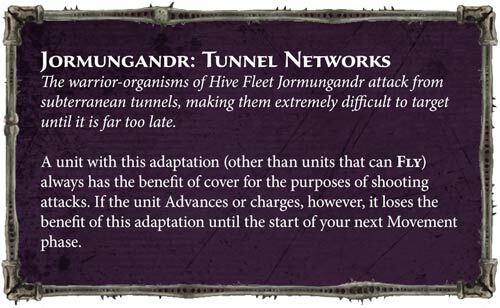 A blanket free reroll failed charges is better for Tyranids than say Black Templars because so many of our units can arrive via reserves. Rerolling failed charging genestealers, melee warriors, big bugs, all gravy. Especially for any unit or monster that can take adrenal glands (assuming that they are still +1 to charge/advance), you can suddenly have a lot of units that arrive via reserves and only need to hit 8 inches on the charge, and with the reroll, that starts to close to 50/50. If you drop 2 a turn, you can be reasonably assured at least one will make it. Assuming we can still put as much as we can now into reserves, this could be a good fleet for an assault army that actually gets to avoid being alpha-struck. Kraken is a mixed bag. 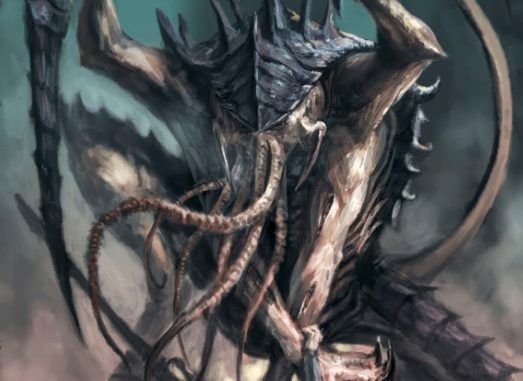 Being able to fall back and charge is definitely useful, but unless we get some changes to our units, I don’t see too many tyranid units making good use of this honestly. Unless we have a lot of upgrades or abilities that trigger on the charge, I cannot see why I’d want my Gant screens to fall back and charge again. In the hands of a savvy player, I could see getting work out of this, but right now, I’m not hugely impressed. The bigger deal is the roll 3d6 and pick the highest for advancing, which for a ground-slogging screen like hormies makes them incredibly fast and capable of moving out to dominate the center of the board on the first turn. If you are looking to just have one detachment dedicated to fast moving screens, I can see using Kraken, but it is still not my favorite. 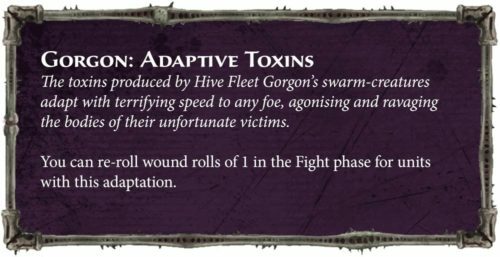 Gorgon is another great Hive Fleet if you want melee. Reroll 1s helps for a lot of our odder creatures like Toxicrenes, Haruspexes, and anything that cannot take scything talons (which already give you the reroll 1s). It also really helps Termagants and Gargoyles be more of a double threat as being able to get some extra mileage out of their relatively weak melee might be enough to push them over the lip of useful as a shoot/charge unit. 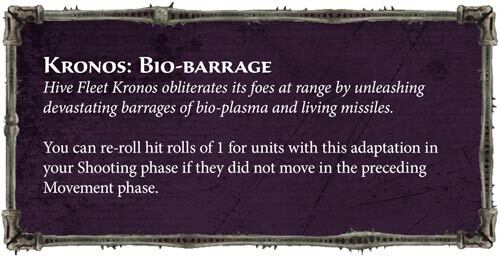 This is also a good way to run massed genestealers and not worry about having to take scything talons or switch between them, especially with a Broodlord nearby for a 2+ rerollable melee unit. This also may be one of the few ways to get Crushing Claw Carnifexes to do work. I can see Gorgon having some real uses for any bug that doesn’t use scything talons. Jormungandr is maybe my favorite for several reasons. 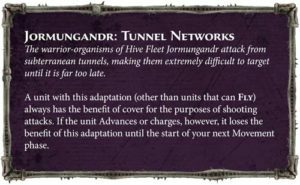 It allows Tyranids to build a relatively static firebase that is pretty durable with +1 armor to our biggest baddies and the usual -1 to hit from the Malanthrope. That makes even a Venom-Cannon (walking) Tyrant or Carnifex +2 save and -1 to hit, not bad at all. Exocrines and Tyrannofexes will be hard to shift at a distance, and it definitely gives us an edge for the big monsters. Especially for our Lords of War like Hierodules, being able to get them a 2+ save at range can make them far more survivable against the usual things like melta/lascannons. This doesn’t help our little bugs too much, but I may try to run this with a Nidzilla build. 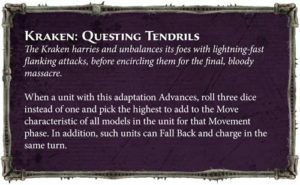 Losing the benefit once you get stuck in does hurt it a bit though, and this is a big nerf to it as most melee units are going to want to advance on the first turn and definitely charge as soon as possible. Honestly, I like this adaptation for a shooting army rather than a pure melee army. Hydra is all about the swarm. Getting to rerolls hits in melee when you outnumber the enemy is a huge boost to our infantry. Even our Genestealers will get a lot of mileage out of this against most enemies, and big blobs of hormagants suddenly become far more threatening when they can actually land 75% of the time rather than 50%. When I try a horde list, I may have a batallion of such so my 120+ infantry can be a threat more than just a meatshield. This is one of the few times I’d consider melee upgrades on my hormies as landing 75% of the time is so much more mileage out of Toxin Sacs. 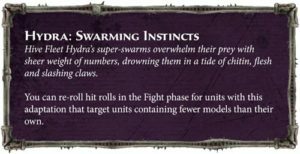 Seeing as Swarms are just good at this game, this may be the one adaption we see the most, or at least does the best in competitive play. Kronos is interesting and seems designed for tyranid gun-lines, which isn’t terrible. Exocrines and Tyrannofexes, our best shooters, really only work when stationary, so giving them a reroll 1 makes sense. The problem is that I am not sure how strong that will actually work in theory, and I may want my Exocrine to have a 2+ armor save through Jorm rather than reroll 1s. 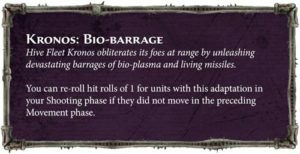 We have to see what the stratagems look like, but the rumors are that Kronos is great anti-psyker, so maybe there is a place for them after all. Of course, Hive Guard get better too, so you can definitely do a detachment of Exocrines, Hive Guard, and Biovores as Kronos and rain hell down on the bio-mass out there. 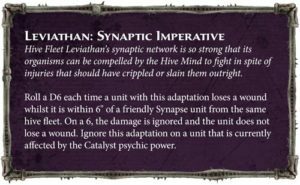 Leviathan brings what may be the best adaption with a blanket 6+ Feel No Pain style roll for any model within 6 inches of Synapse. That is just 16% more efficiency for our units, and really, this works in a lot of ways. For a horde of naked termagants, that equals to just about 5 more gants alive, so 20 points, which isn’t a bad return on investment for a free upgrade (to say the least). 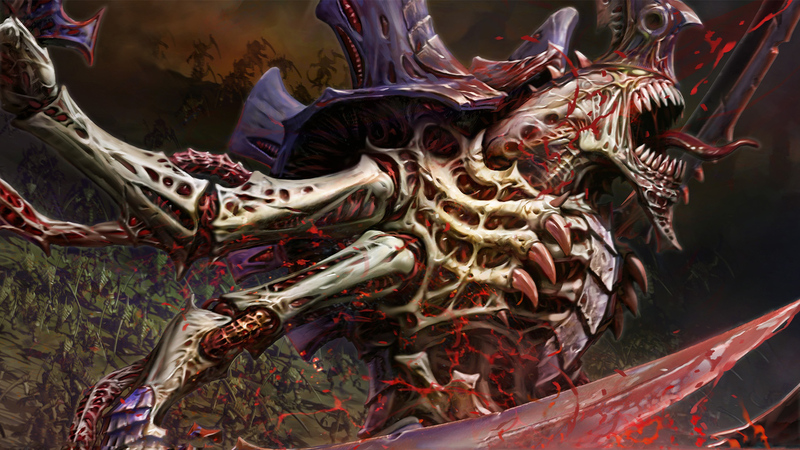 You can also use this for monster-mash to give our big bugs some form of defense, and I could even see units of Zoanthropes, Maleceptors, Genestealers, and Hive Tyrants become problematic as they now suddenly have two layers of defense rather than just one. 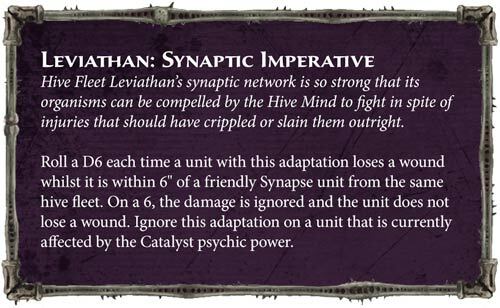 This of course depends on they are worth taking, but a flat 16% increase to survivability by staying close to Synapse (which most Tyranid players do my habit anyway) is boss. 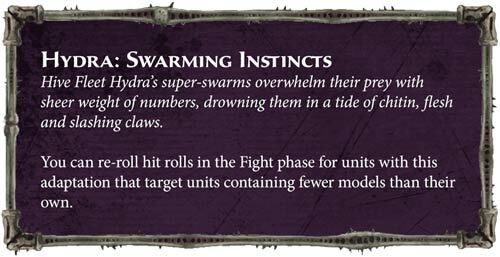 It is definitely a defensive buff, but then that is something Tyranids have needed for a long time now. Overall, I am damn excited. Whether it be horde, monster-mash, shooting, melee, smite, or any combination thereof, I think bugs have already seen a huge boost. We know other changes are coming, so let’s keep hoping! Thanks as always for reading, and you know the drill. We have a small media empire, so come enjoy it: Facebook, Twitch, YouTube, and Patreon. Hopefully I can get some Shadowspire games in to occupy me until my beloved Hive Fleets return.